Research into what prevents the public reporting suspicions of terrorist activity will be key to the success of a new campaign from anti-terror police, according to its campaign manager. 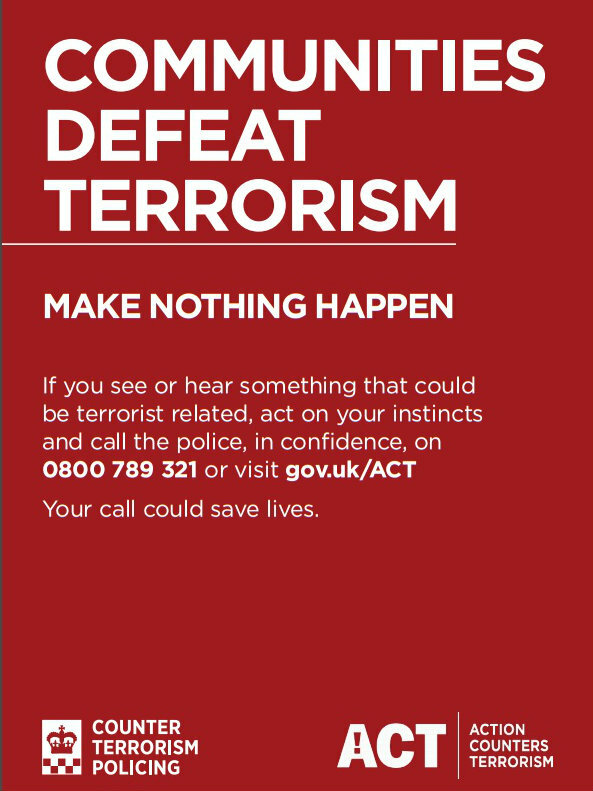 The National Police Chiefs Council yesterday launched ACT (Action Counters Terrorism), a new strategy designed to encourage the public to play a part in helping tackle the terrorist threat facing the UK. ACT includes branding, a new website on the Gov.UK portal, two podcasts available across a number of formats, posters (see end of story) and films (below) made by creative agency AMV BBDO for the NPCC, which include the plea "don't worry, don't delay, just act". The films are being promoted on YouTube and Facebook, and the NPCC has also bought ad space on Google against certain key terms. The campaign was launched at an event in Manchester yesterday morning, and media were briefed under embargo on details of the campaign, including the statistic that 13 potential terror attacks have been foiled by British police in the past four years. This eyecatching figure, and comments attributed to campaign commissioner and senior anti-terror officer Mark Rowley, were covered heavily across the media. Pippa Eames, NPCC campaigns manager, told PRWeek yesterday (Monday): "We were very mindful that counter-terror comms have covered off some very targeted and some very broad campaigns over the years, but we wanted something to pull it all together... with all the counter-terror messages, what we want people to do is act." She said that the model of having one over-arching campaign to summarise various messages was similar to the Department of Transport's long-running Think campaign. The campaign's budget is a "quite small" £750,000 for all aspects, including research, creative, media buying and evaluation, Eames said. Research for the campaign was undertaken by media agency MediaCom, which produced quantitative and qualitative research on public attitudes towards counter-terror policing. It found that while 73 per cent of people are concerned about terrorism, 26 per cent said they might not report suspicions because of fears over wasting police time, 29 per cent because of being worried their suspicions were wrong, and 39 per cent due to being unsure what suspicious behaviour might look like. 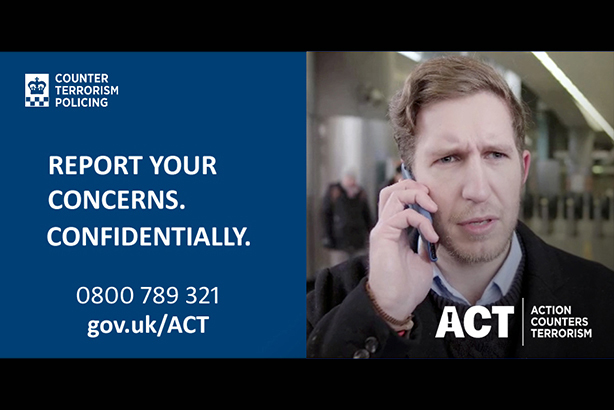 The ACT website says: "You should report suspicious activity or behaviour – anything that seems out of place, unusual or just doesn’t seem to fit in with everyday life." It provides various examples, such as individuals being vague about where they have been during long periods outside of the country, or hiring large vehicles with no clear reason. Eames said research had also revealed concerns that reporting suspicions would immediately lead to highly visible police actions. "People in focus groups almost felt that if you report, the next thing that happens is your neighbour's door is being knocked down," she said, adding that police intervention was far more proportionate and subtle. Being sure that reports were made in strict confidence was also important, she said. She said this insight was key to forming the campaign messages and materials: "I think we’re really understanding what the barriers [to reporting suspicions] are, and we're responding to the barriers." Eames said the campaign would be evaluated against future data, which would reveal whether public attitudes towards terror and anti-terror policing had changed, including regular Metropolitan Police and Home Office surveys, to which it has access. Evaluation will also be based on monitoring calls and reports of suspicious web or social media content.